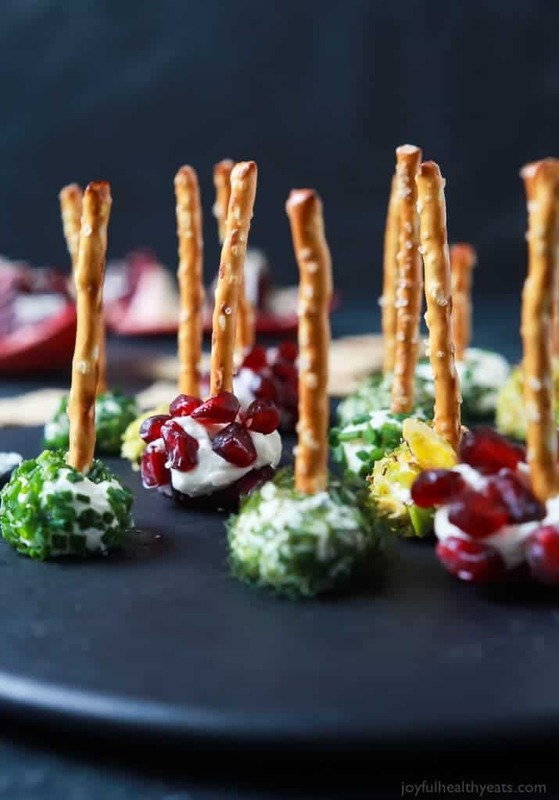 Everyone loves a good cheese ball, but your guest will fall in love with these Assorted Holiday Goat Cheese Balls coated with a combination of fresh dill, chives, pistachios, and pomegranate seeds! Welcome back to reality folks! Today is Monday and not just any Monday, it’s the Monday after Thanksgiving weekend. Which if you’re like me, is one of the harder Mondays of the year. All weekend long we spent time eating, decorating, relaxing, watching WAY too many Hallmark Christmas movies and making memories. I don’t want it to stop. But then…. oh.. but then… Monday comes! I guess the only bright side is tomorrow will be December!! Woot Woot! Since today is the last day of November I wanted to do something special. I received a lot good feedback from the GMO post I did 2 weeks ago and I wanted to share something with you, from the farmer perspective that I think you will find interesting! One of the people I met on the trip was a sweet mom of two almost three named Sarah. She actually has a blog called NurseLovesFarmer.com where she writes about being a mom, a wife to a farmer, what life looks like on the farm, and agriculture in general. I was able to ask her a few questions to help her share her story and perspective on the food that we grow for our rapidly growing population. What is something you didn’t expect to deal with when you married a farmer? How much single-parenting I would be doing. I’m essentially doing everything for me, the kids and our home for a good 12 weeks of the year when he’s busy working 16+ hour days planting the crops in the spring and then harvesting the crops at the end of summer into the fall. Before we had kids I kept busy working at the hospital and doing my own thing, and even having one child didn’t phase me, but as our second son got older, it really hit me how hard it can be to be a farm wife, especially not growing up on a farm myself, having my dad home every single night for supper year round. What would you say to people who believe many conventional farming practices have a negative impact on the environment? I would say that they have every right to believe that. The statistics in Canada and the United States are very similar: <2% of the populations are farmers. That’s 2% of the entire population of the country that are actively farming the land for 100% of the people; and the rest of those 98% are now 3 or more generations removed from their farming heritages, so it’s no wonder there’s a huge disconnect between us and our food now. What I would say is that we need diversity in agriculture and farming is not a one-size-fits-all method for every farmer. We need conventional, organic, mixed operations and more. Not one way is the best, not one way is the worst. The use of conventional farming practices on our farm, like the use of no-till farming (where we disturb the soil as little as possible), this saves on diesel fuel, carbon emissions, can reduce soil erosion by 90 to 95 per cent or more compared to tillage practices, and continuous no-till can make the soil more resistant to erosion over time. Studies have shown that soil under no-till agriculture sequestered on average 29 per cent more carbon than soil under conventional tillage. We are growing more food on less land than ever before with the use of tools such as biotechnology (GMOs) and pesticides on our farm. A fact I love is that in Canada alone if we were to not use GMO crops and pesticides at all, we would need 37 million more acres of land to be able to produce the same amount of food, which is equal to all the farmable land in the province of Saskatchewan! You grow both GMO and Non-GMO canola, what is the process for each of these on your end? Pros and Cons? The process of planting is exactly the same whether it’s GMO or non-GMO seeds, however the products used on those seeds will vary. We grow RoundUp Ready canola, which means that the canola plant has been bred with biotechnology (GMO) to be resistant to the pesticide RoundUp (or more specifically the active ingredient in RoundUp, glyphosate). The reason we grow different varieties of canola is so we can use different groups/classes of pesticides, so we’re not using the same thing year after year on our soil and our crops and weeds; this is part of our crop rotation and making sure we’re using a wide variety of pesticides and not the same thing over and over. Do you feed your children GMO foods? Do you see any negative impact it can have on our bodies? Yes, I sure do feed my family GM foods, though honestly by the time that most foods made with GMO crops are made (canola, sugar, corn), the DNA is refined and processed out of the food, so technically there is no “GMO” in the final product; though this isn’t a worry for me and my family. There are only 8 GM crops available on the market to farmers right now: canola, soybeans, corn, cotton, papaya, alfalfa, sugar beets and squash. Pretty soon there will be GMO Arctic Apples available and as a mom I’m actually looking very forward to purchasing these, they have been genetically engineered to have the browning gene “turned off” so the apples won’t brown when exposed to air like they normally do. As a mom of 2 young boys, this excites me as I can send apples in their lunches without them turning “yucky” and mushy, as they often tell me. This is just another food choice available to consumers, and I’m 100% pro-food choice no matter what anyone wishes to buy for their family—all conventional, all organic, all non-GMO—doesn’t matter to me. There have been no documented illnesses or harm to the human (or animal) body from the consumption of GM foods, I certainly haven’t seen it in my family and my husband has worked with GM crops for the last 20 years or so. What is the main topic that is largely misunderstood when it comes to farming? GMOs and the use of pesticides, without a doubt. There’s actually a whole list I could give you, but those are the top two for sure. I feel because of the disconnect from farming that I talked about before, people don’t understand what farmers do and why. Studies have shown that people trust farmers, but not the technology that they are using. It’s a bit ironic to me as a farm wife and mom, that our society embraces technology in every single facet of our lives (need to have the newest iPhone, without any thought or questions asked! ), but a lot of them are still skeptical about the advances of technology in our food system used by farmers. 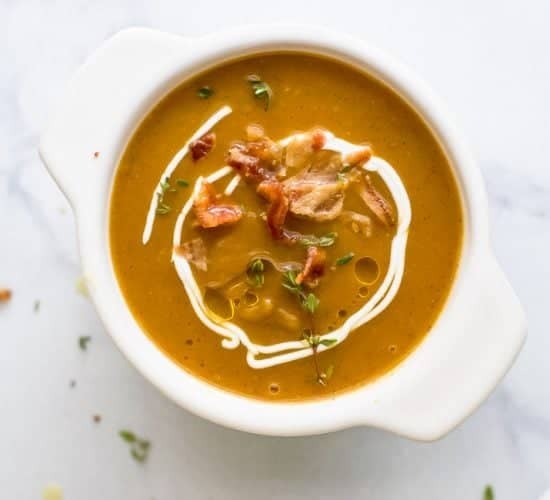 I understand it, I truly do—food is a highly emotional subject and we are very connected to our food and what we put into our bodies. So many people feel that we douse/soak/drench our crops in pesticides, simply “because we can”, or even worse, that farmers intentionally want to hurt/poison/kill people (which makes me really upset and disappointed). Pesticides cost a lot of money, and no business would ever want to spend more money, “just because” and would certainly never want to cause intentional harm to their fellow man (farmers eat the food they grow too!). As Dr. Joe Schwarcz says: “farmers aren’t in the business of killing their customers”. One of my most popular blog posts shows how little glyphosate (RoundUp) we use on our canola crops. Ok, it’s me again Krista. I just wanted you to have the chance to hear from the source and read some of Sarah’s insights from a farmers perspective. I know since my trip my view point has changed and I have a tender heart towards those that are producing the food that we eat and trust that they are producing the best possible crop they can. While I know not everyone will agree with these insights I think it’s helpful to get both sides. 🙂 Don’t you! 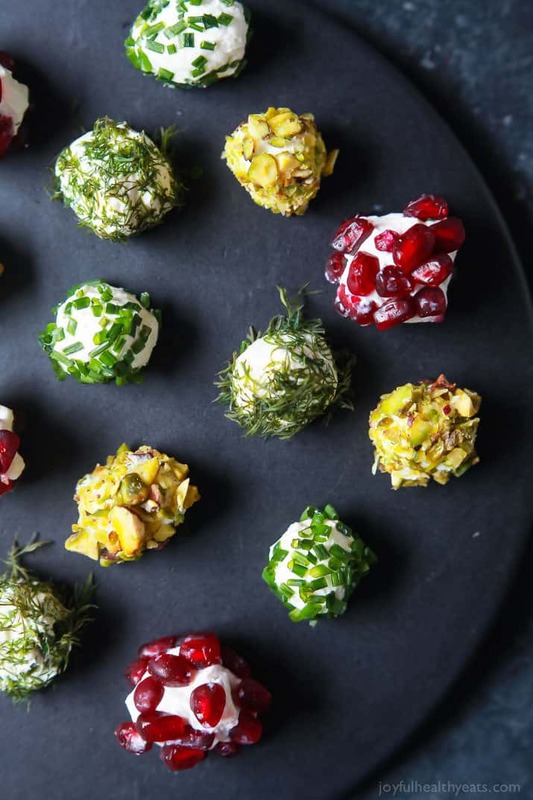 And these Assorted Holiday Goat Cheese Balls will definitely leave you feeling happy and excited for each new cheese ball you try! 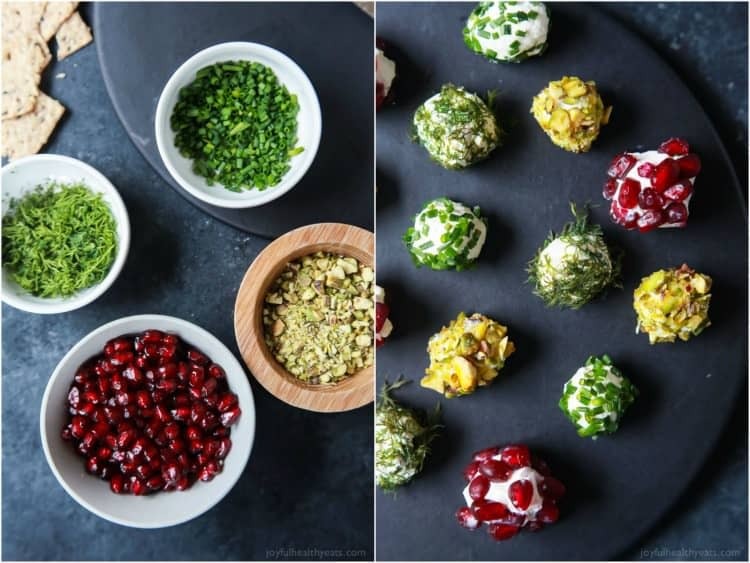 I had so many different ideas on what to roll my goat cheese ball with that I couldn’t decide – which led to me making mini goat cheese balls so I could use each and every idea I had. Problem solved and wow are these good! Plus anything mini is fun! Right? 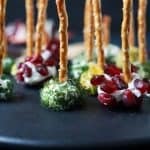 You and your guests will love being able to try the cheese balls topped with fresh dill, fresh chives, pistachios, or pomengrate seeds and decide which one you like best. You can eat them right off the pretzel stick or spread the goat cheese ball on your favorite cracker. Either way these need to be at your next holiday party! In a food processor add cream cheese and goat cheese. Blend until combined. Place goat cheese mixture in refrigerator to cool for 20 minutes. 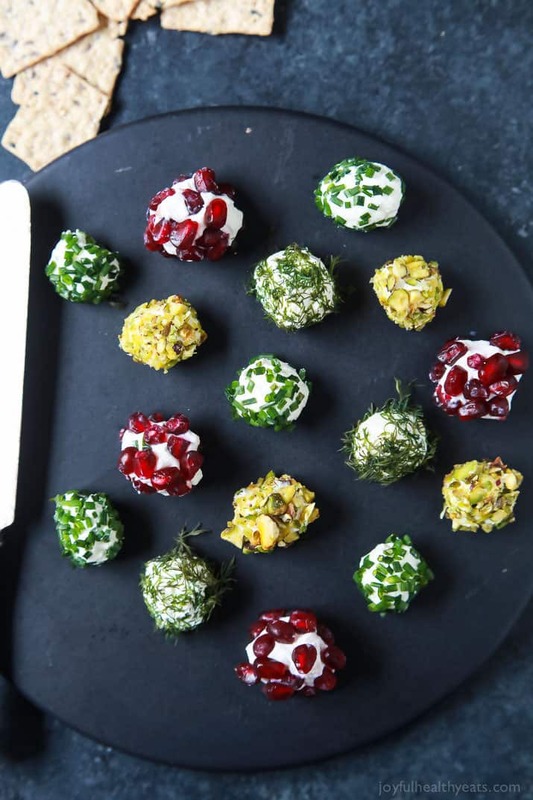 Remove goat cheese mixture and roll into 1/2″ mini balls (you should be able to get around 20-25 balls out of the goat cheese mixture) When finished, place on parchment paper and put in the refrigerator for 20-30 minutes to harden. 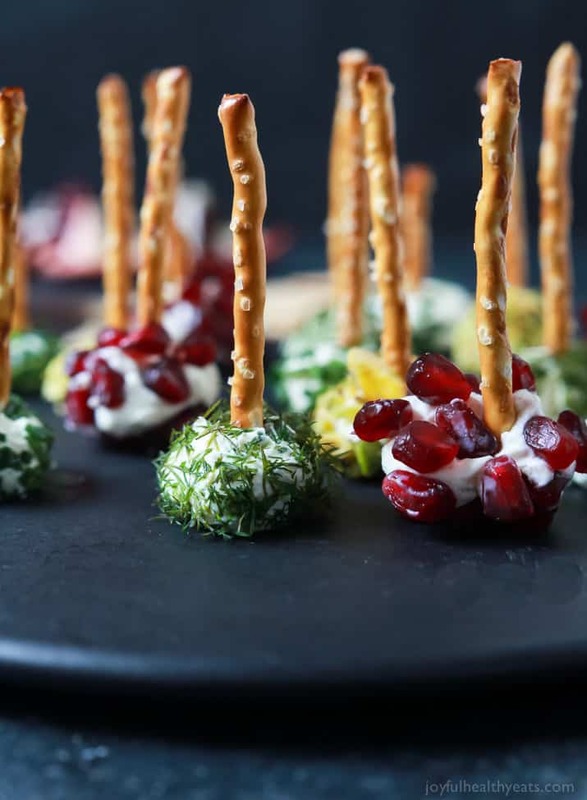 Remove the goat cheese balls from the refrigerator and roll them in the toppings (crushed pistachio, fresh dill, fresh chives, and pomegranate seeds) Place a pretzel stick through the center and serve. Optional: serve with your favorite crackers. Hurray! Can’t wait to hear what you think girl. So glad you liked them! Sarah had a lot of great things to share! Plus I can see a lot of people making and enjoying these goat cheese balls this season!! Such a fun easy recipe! Love how festive they look – a perfect holiday appetizer! 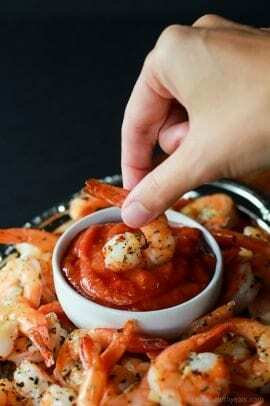 Such a fun idea for appetizers! These will be perfect for the holidays! Ahh I don’t like this reality…I loved our first holiday as a family of three! But the only thing that makes me enjoy it is looking at these beautiful little bites! hehe… enjoy girl! 🙂 And yeah for 1st holidays together! hurray! I’m all about the make ahead too girl, it’s a must have during the holidays for sure! 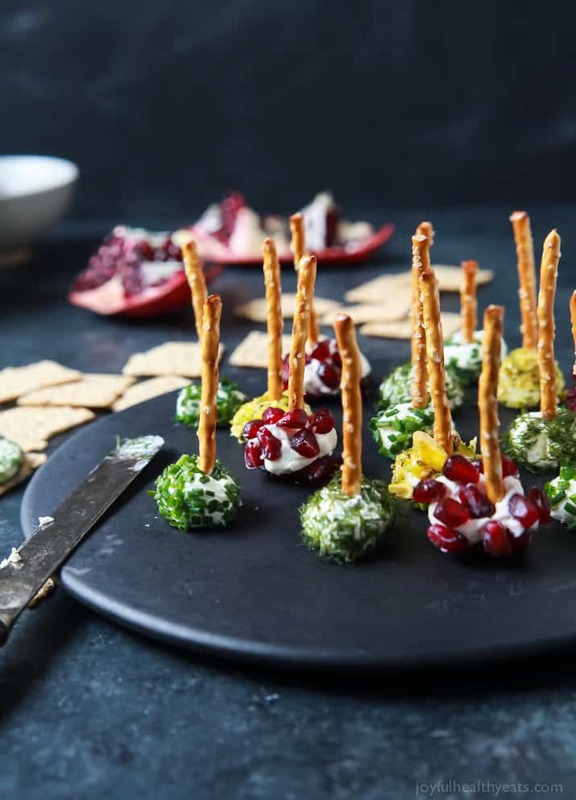 What a fun and festive (and easy to make) little appetizer! Adorable and convenient to eat 🙂 Thanks for sharing the perspective of the “farmer’s wife.” Lots to think about. Also, I didn’t know no-till farming was a thing! Cheers! Ok these little goat cheese balls are perfection! I LOVE how perfect they are for the holidays. Wow! 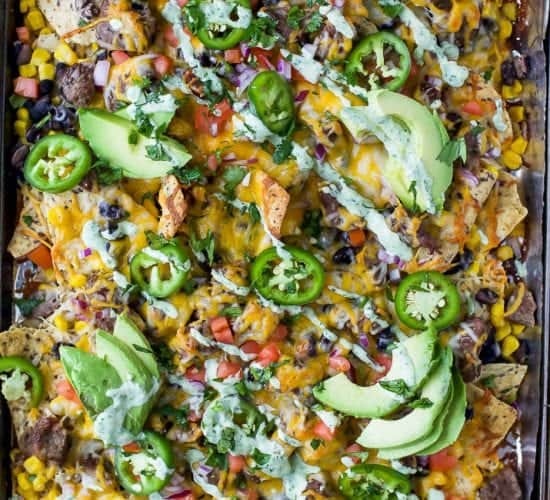 What a colorful recipe! Looking so delicious! I must try this easy recipe on next holiday. OH MY GOSH. I am so in LOVE with these little balls. 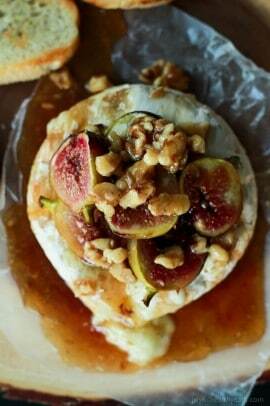 I could eat goat cheese every day, all day long…and with all these flavors, I ACTUALLY could! Pinning! 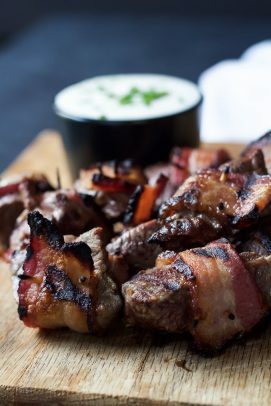 I’ve always wanted to make an appetizer like this – they look wonderful and tasty! Well now you can! Hip Hip Hurray! 🙂 Thanks Deb! These are SO cute! 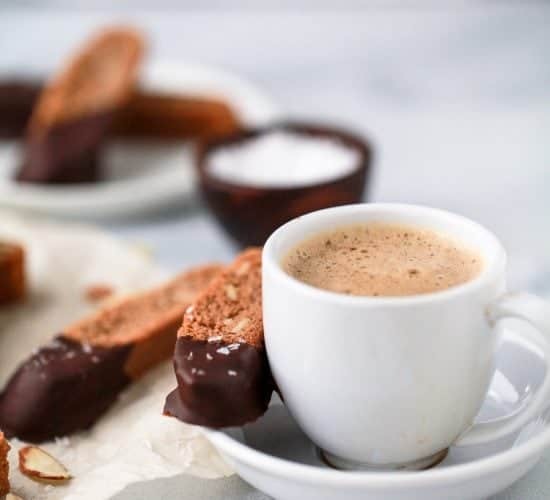 Such a great way to make single serving bites! Thanks so much Kimberly Ann! It has been tough to get back in the swing of things this week after the Thanksgiving holiday. It will be the weekend again before we know it, though. 😉 These cheese balls look so good! I love how easy they are to customize! True that! Weekend can’t come sooner. 🙂 Glad you liked the cheese balls girl! Definitely making these for Christmas Eve! How far in advance can I make the cream cheese-goat cheese mixture? You’ll love them Barbara. You could make the goat cheese mixture probably a day or two ahead of time but I wouldn’t roll them in the other ingredients until the day of. Thanks so much! I can’t wait to try them! You’re welcome Barbara! You’ll love them! Did this last night for an appetizer with another couple. Easy. Delicious. We ADDED an option the ones above: Prosciutto (baked & chopped)… Not a bad addition. This will be a fun, go to appetizer moving forward. Oh.. love that addition! I almost did bacon myself. 🙂 Glad to hear it was a hit! Awesome, you make this like an artist. Looks so yummy, my kids will love them. Thank you for your sharing! Ohh thanks Anthony! 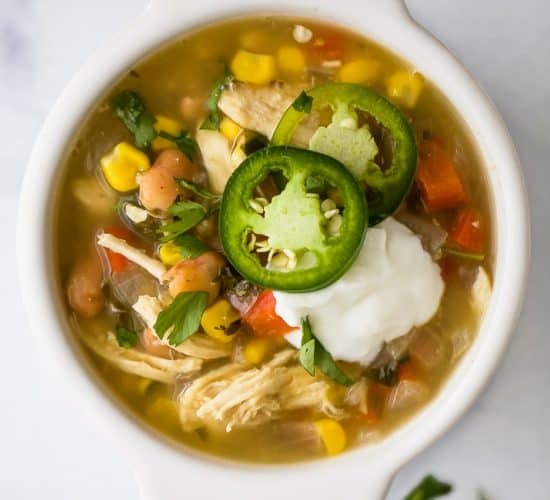 Hope you the kiddos enjoy this recipe! 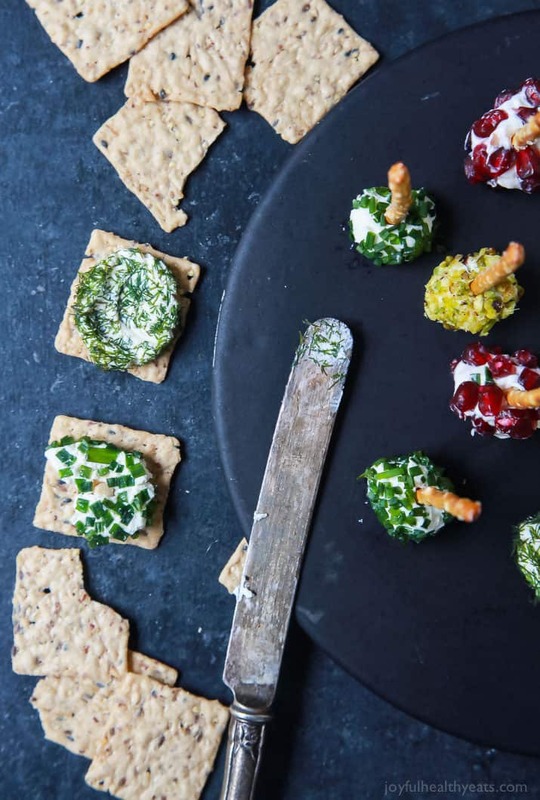 I’m not normally a fan of dill but with goat cheese… wow! Yum is all I have to say! Your recipe looks very delicous and healthy. You made it like an artist. I will try it soon. Thank for share this awesome post. Ohh thank you so much Karen! You are too sweet!